Step 1 Combine the sugar and water in a 3-quart saucepan and bring it to a boil. Add the rhubarb. Return to a boil, then reduce the heat and simmer until the rhubarb is soft and falling apart, about 5 minutes. Cool to room temperature then refrigerate overnight. Step 2 Strain the pulp and discard it. Combine the rhubarb syrup with the vodka and lime juice. Step 3Freeze the mixture in an ice cream maker according to the manufacturer's directions. Spoon the ice into a chilled loaf dish. Cover and freeze until ready to serve. 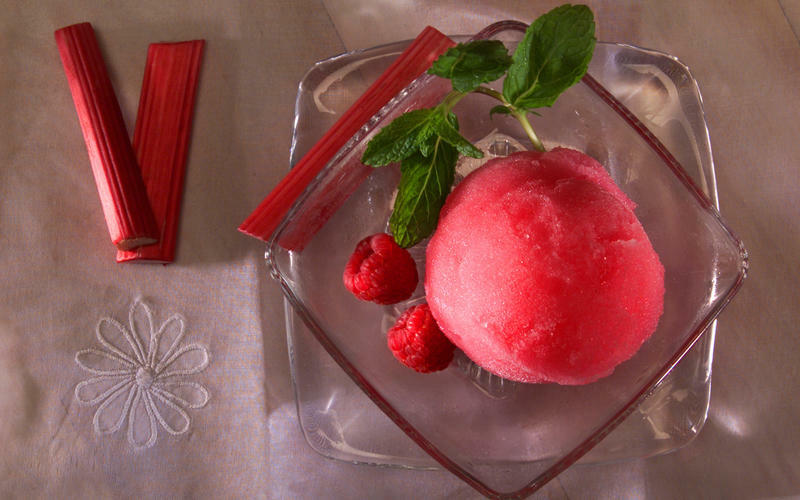 Spoon the ice into serving glasses and garnish each with some mint leaves and a few raspberries. In Recipes-list.com we have selected the most viewed recipes from category - Best recipes Desserts . Enjoy the best recipes specially selected for you! Rhubarb and raspberry ice is the right choice that will satisfy all your claims.